I'm still trying to figure out everything that I want to say about the Medtronic Diabetes Advocates Forum. So much was crammed into such a short amount of time. There are a lot of things I want to say. So I'll be breaking it all up into multiple posts so as to not write a novel. Bear with me. First of all, I want to say what a tremendous honor it was for me to be invited to attend this event. I truly mean that. Never have I been invited to participate in something like this before. I was nervous as I flew to LA, but so excited at the same time. The fact that I already knew a number of people attending from Friends For Life last year helped me to feel less nervous. But still. The forum officially began with dinner Thursday night. 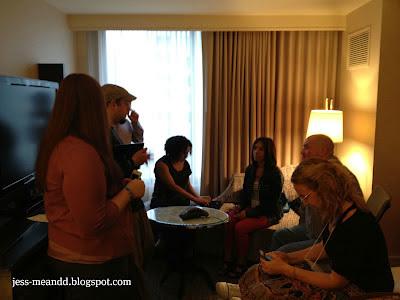 As we gathered in the hotel lobby, the nerves kicked in again. I look across the room, and oh-my-god-it's-Manny! THE Manny! And he knew who I was right away and gave me a big hug! (This would not be the first time I've been totally starstruck and uncool when meeting DOC peeps- I spent most of FFL that way). I was so honored to meet those I hadn't, as well as see everyone else again. Before dinner, some of us packed into a hotel room to watch DSMA Live being broadcast, live and in person! We attempted, somewhat unsuccessfully, to keep the shenanigans to a minium, being on air and all. It was neat to be in the room, and be able to participate in the show a little. You can listen to the episode here. After DSMA Live, it was time for dinner. Each table had some of us crazy bloggers and two brave Medtronic executives. I sat next to Kevin Lee from Medtronic, Vice President of Pump Marketing and Reimbursement. It was neat to interact with the executives and to hear their side of things. And they seemed to think it was pretty neat to interact with us. Friday was a full day. Some of it was us listening to Medtronic talk about the things they are working on, and some was Medtronic wanting our opinions on various things. I'll get into more specific details in later posts. As I sat there at Medtronic on Friday, I just kept looking around the room in awe. 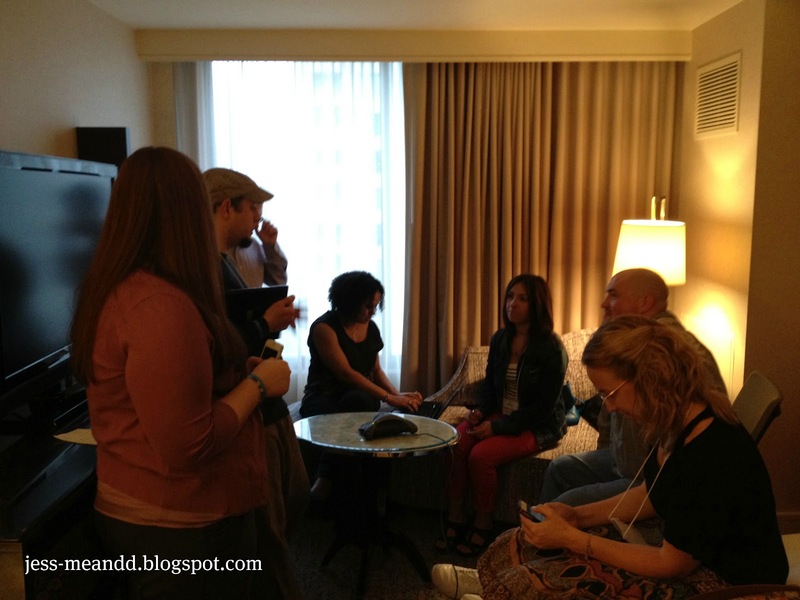 Was I really sitting there in that room with these brilliant people from the Diabetes Online Community? Really? Someone pinch me! And I do mean brilliant. We are so lucky to have such people on our side. And I'm not talking about Medtronic. I'm talking about the people invited to represent the DOC. Some of the smartest people I've ever met were sitting in that room. Because when it comes right down to it, that's what I was doing there. 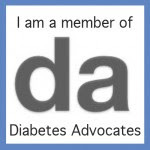 Doing my best to represent my friends in the Diabetes Online Community. Yes, I use Medtronic products. But my loyalty is to the DOC, first and foremost. And it makes me happy to know that there are such brilliant people in the DOC working for me. Working for all of us. My disclosure about MySentry will be forthcoming. I'm still working on what I want to say. If you want to know what others have said regarding MySentry disclosure, please check out Kim, Sara, and Bennet's posts. I'm right there with ya girl. I had to catch myself while looking around the room, because if I looked too long, I would start getting all emotional... not to mention I'd miss something - the forum went SO fast! Just as I felt last year! I'm so glad it was an awesome experience again! Looking forward to your follow up articles! So glad this was a great experience! This is great. I would love to talk to Medtronic about my experience. Maybe we can arrange a tela-town hall or a Google Hangout to discuss products and the like. I think it is a testament to the fact that they are "working for all of us" that they invited people who are NOT using their products to contribute to the discussion.